Feeling angry and irritable is often a natural reaction to the many challenges and changes that arise with everyday life, but sometimes, especially when experienced to an excessive degree, these emotions can be a sign of something more serious. It is important to be aware of what is normal and what is considered “extreme irritability.” Read on to learn about how to differentiate between these two and the possible conditions that extreme irritability could be a sign of. It can be hard to recognize when you feel more than just irritable, but when anger and impatience are no longer temporary - but rather have become the norm - you are most likely experiencing extreme irritability. If these emotions have dominated your temperament for two weeks or more, or are beginning to severely affect your life and relationships, it is advisable to seek professional help. It can be difficult to acknowledge that this might be the case, particularly if you yourself have not realized it - sometimes, it takes a friend or family member to point out the change in your behavior. What Are the Causes of Extreme Irritability? Depression. There are many symptoms of depression, and extreme irritability is one. Particularly in young women, suffering from anger and irritability is common rather than despondency or fatigue. Chronic fatigue syndrome (CDS). This illness can often be misdiagnosed due to the fact that its symptoms are nonspecific or similar to many other conditions. As well as tiredness, difficulties in concentration, and physical pains, irritability is often seen. Anxiety disorders. There are several different types of recognized anxiety disorders, but many of these include extreme irritability as a symptom. Other signs include a constant restlessness, muscle tension, and insomnia. Obsessive compulsive disorder (OCD). OCD is thought to affect around 12 in every 1000 people, and studies have shown that around half of these experience extreme irritability or even anger attacks. Premenstrual dysphoric disorder (PMDD). This is a more severe type of premenstrual syndrome - or PMS - which involves a lot of the same symptoms but to a higher degree. Among other symptoms like mood swings, extreme irritability is common. 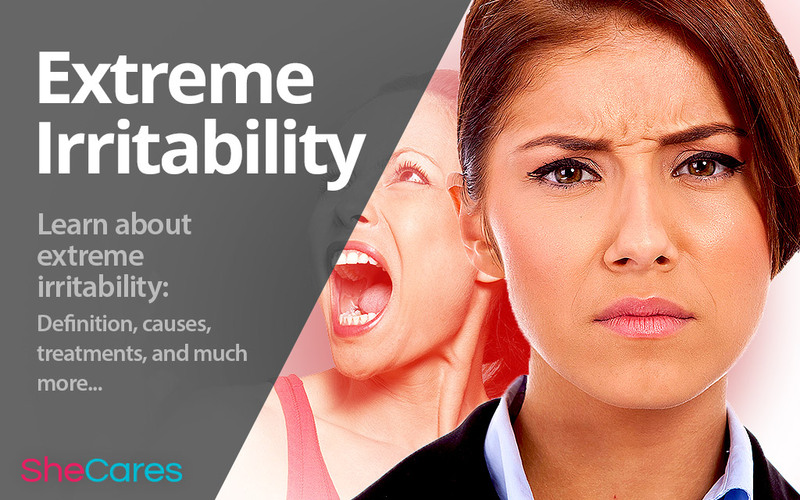 How Can Extreme Irritability Be Treated? Keeping a sleeping schedule. It is known that lack of sleep is detrimental to mood, so if you can manage to commit to a regular pattern of sleep, it should help to ensure that you feel refreshed and more positive, lessening the chances of irritability. Taking regular time to relax. Whether this be alone or with friends and family, finding time to unwind each day is very beneficial for the mind. Quiet reflection can be calming, or spending time with loved ones can improve mood by reminding you that you have people who care about you. Exercising frequently. Those who exercise regularly benefit both physically and psychologically. Endorphins are released when you exercise - these are neurotransmitters that cause a feeling of euphoria. Certain medication. Your doctor may suggest administering medication, particularly if your extreme irritability is excessive and persistent. There are many options available, and if one doesn't work, another might. Becoming aware that you are suffering from extreme irritability can be somewhat disconcerting. You should find it comforting to know that you are not alone, and there could be a number of different reasons behind this symptom. The most important thing is to acknowledge that there has been a change in your temperament, and then the next step will be finding out why and what you can do about it.